Dan Gilroy’s first film Nightcrawler was a creepy, uncomfortable and downright chilling look at the unexpected coupling of sociopathy and freelance video journalism, and the disturbing consequences that arise from when those two things come together. So, to say that his follow-up film Roman J. Israel, Esq. is very different from that would be a massive understatement. This time, Gilroy goes for a quieter and more streamlined legal drama, with the one thing it has in common with Nightcrawler being an exceptional lead performance by an actor (Jake Gyllenhaal in Nightcrawler, Denzel Washington in this) who’s well up for the task, no matter how seedy or morally corrupt their character may be – but outside of that, there are quite a few pitfalls that stop it from being as good as his previous film was, and make it seem more like a misfire than if there weren’t. Washington is Roman J. Israel, Esq., a criminal lawyer at a small firm in Los Angeles who clearly has some type of undefined autism, as he rarely makes eye contact while he talks, walks around with Walkman headphones over his ears, wears some old and pretty hideous suits, and lives in a rundown apartment that, like his mental state, doesn’t seem to have aged at all for a good few decades. For years, he has been trying to fight for those who cannot be heard, and has been developing a brief which he believes will change the justice system forever. He is forced to step up his game, however, when his firm partner suffers a heart attack, and due to the firm’s bad financial stability goes to work for a much larger firm run by successful attorney George Pierce (Colin Farrell), and as he struggles to fit in to his new role he makes some decisions that will make him question his moral centre and everything he has been fighting for over the majority of his professional career. The first, and major, thing to note about Roman J. Israel, Esq. is that it is largely carried on the sheer talent and on-screen charisma of its lead actor. Washington is nothing short of excellent in this film, successfully conveying his character’s difficult and often ambiguous nature which itself is marred by how his social awkwardness hinders himself from being a much more approachable person in the workplace. It’s never exactly stated what kind of disorder he is suffering from in the film, but there’s no doubt that this man is on the autistic spectrum, and as someone who’s firmly on that spectrum I can easily identify the characteristics and mannerisms he is exhibiting as that of someone who most definitely has a high-functioning type of diagnosis, something that Washington does with complete brilliance here. Though the film is not being fairly well-received by critics – it currently ranks at a meagre, and rather accurate, 53% on Rotten Tomatoes – Washington is not part of why this movie doesn’t entirely work, and as he usually is he’s consistently glorious to watch on-screen. Washington is the film’s MVP by far, because the rest of the movie is a bit of a jumbled mess, at least in the script department. Gilroy has made it look as handsome as he possibly can, and he is a fine director, but for some reason – and it comes off as especially odd because prior to directing he was largely known as a writer – his screenplay for this is filled with heavy-handed twists and revelations that really don’t add up to anything believable. At the mid-point of the film, the main character does something that is wildly unethical and against everything he has fought for, and it not only seems extremely out of character, but there was nothing leading up to that which would indicate a strong enough reason as to why he would do such a thing. It seems to suddenly come out of nowhere, and how he acts for a period of time shortly after contradicts who he was set up to be in the first place, making it seem like he’s become a completely different person for no good reason, other than that the script demands there be some kind of conflict. It falls apart so quickly due to it not making a lot of sense as to why a character like this would suddenly have this change without any build-up or even a solid explanation. There also feels like there’s a movie that’s about to happen, but it never really does. Aside from the one pivotal moment at that mid-point, which even then is quite a large stretch for the audience’s perception of disbelief, there doesn’t seem to be much of a point to this movie’s existence, or a solid point that it actually wants to make except for some heavy-handed stuff about how the law system is broken and the people who try to fix it can become just as shady, which is a shallow and baseless fact as it is. If anything, this movie exists solely to prove that a fantastic actor like Denzel Washington can carry a movie like this in his sleep, and if that was indeed the point then at least there would be reason for this particular story to be told. Otherwise, unless you’re a Washington completist, this is a misfire that at the very least has the dignity to boast another terrific performance from the actor instead of being just another wasteful movie with hardly any point or logical motivation for existing at all. Roman J. Israel, Esq. 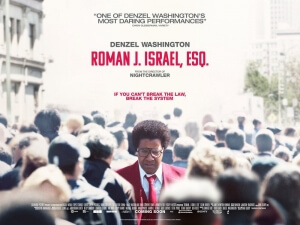 is a dignified misfire that, despite a terrific lead performance by Denzel Washington, suffers from a script that goes nowhere and fills itself with nonsensical plot twists and irritatingly ambiguous character motivations.